Crisp lines based on the classic cube. Cutting edge technology. 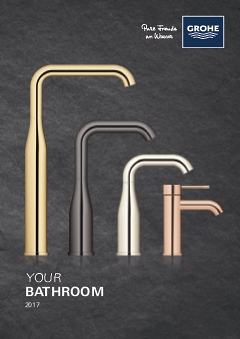 What more could you want from a basin tap? The stylish and minimalist GROHE Eurocube Joy two-hole basin mixer is perfect for anyone who wants a cool and contemporary bathroom or cloakroom. This stylish two-hole also packed with cutting edge technology. The multilayered coating of the purest StarLight chrome ensures the finish has a sparkling shine that lasts for years. The GROHE AquaGuide variable spout end allows you to point the water flow where you want it, depending on the depth and curve of your bathroom basin. Instal with our concealed body (23429000). This elegant tap beautifully complements all the other products in the collection so you can design a coordinated and seamless bathroom.